Before having Oscar, I intended the basement to have one purpose – to be my office / studio. However over the years, many things changed – I had a child, my business grew, my business changed, and slowly we realized we needed two defined areas of the basement. A family area, and, a well designed office for me. Working with one major open space is pretty tricky, so over the last few years we’ve contemplated how to make it work. We lived with a transition of styles – I think it’s a fairly common problem in households. You decorate as you have the budget and needs and uses of rooms change. The end result, at least in this situation, is that a room starts to feel like a hodge-podge of styles. Fast forward to today, and even though our lives are still changing – I felt comfortable enough in how we as a family use the space, to invest some time and money in making the basement done. Here is the progression of our basement from one open area to two defined spaces – without adding any walls up. Ps., You can see all blog posts about the basement and changes here. Aubrey and I have been searching for the perfect couch for our basement for a few years now. I did a ton of research and fell madly in love with the Crate & Barrel Willow Couch with the pullout bed function. The pullout bed feature makes this small space usable as a spare bedroom, if someone wants to crash. Since my office is now separate using a room divider (more on that below) I don’t feel as though I need to clean / organize or put major things away if someone comes unexpectedly. The cabinet that I scored out in cottage country got a coat of white paint and new hardware from The Home Depot to bring it to life. We store our toys in here and are accesible to Oscar at any time. My new desk (see this post) brightens up the office. I hung a gallery wall of my Penny Paper Co. prints and left the wall above my computer blank – as I found too much hanging in front of me while I worked tended to be distracting. Instead I hung inspirational images by my computer using the glorious washi tape. It doesn’t leave residue on my walls and yet allows me to hold up pages that inspire. I prefer this look to a structured bulletin board, which I moved into the “family” area of the basement. On this side of the office, I have my “work” desk where I work on products, paint, package orders, or sketch up new lines. A vintage chair I found at Value Village is softened up with this geometric pillow I found at HomeSense. Beside the chair you can see that I have my much used graphic tablet tucked into a lucite box, for easy grabbing when I need to draw, but it doesn’t clutter my desk. My favourite candle, vintage stamp dispenser via ETSY, and samples of the Fall 2015 Penny Paper Co. stationery line Prints are organized, ready at hand to ship. Samples of my Fall 2015 wrapping paper line is being tested. (Eeeeee!) From where I sit at my desk I can watch Oscar play in the “family” area of the basement. Toys naturally stay in that area, and Oscar will wander between the areas, to come visit me while I’m responding to e-mails. He’ll sometimes hop up ONTO my desk and sit with me while I work. It’s important for me to address this storage / bookshelf that I’ve shown above. It’s actually NOT permanet. It’s a bookshelf from Ikea, put ontop of a base cabinet (again, Ikea) and we’ve built a false wall around it that is temporary. From the other side it looks like a wall (we’ve painted plyboard the same wall colour) and attached it all together to make it look like it is a wall. But infact, it’s not. Instead of building the “wall” to the ceiling, I’ve instead left some relief so that light comes in and doesn’t make either room feel small. It is exactly the same height as the cottage cabinet we purchased, so it looks like it was all planned as such. Little details do make the difference! My paint brushes are held in a vintage crown jar. That’s it! The basement isn’t styled, so you may see toys, or a random piece of paper floating about. Cords are everywhere, but I have tried to tidy up for the photos as much as possible. But when you’re running a busy household nothing stays like anything for long. Now we have two distinct areas of the basement – one for work, one for play, and yet I don’t feel closed off from either area. Oscar is free to walk into my office whenever he so chooses (no door!) and magically respects that the two areas are indeed two different spaces. He comes in sometimes to get printer paper to draw with, or to hop up on my desk while I’m working. It’s really a lovely space that I feel so fortunate have. I hope you maybe find some inspiration from this long winded post, for something for your home. Whether you have a bachelor apartment and now have a vision to how to divide a space without needing walls – or perhaps you were looking for a sleeper couch (GET THE WILLOW COUCH!) I leave you with the shopping list below. Enjoy! Wall Art .……………. The Penny Paper Co. When we renovated our basement waaaaay back when, we had little money, and yet the need to create a functional work space for as I ran my shop. I came up with a DIY desk that cost me under three hundred dollars – and the desk served me well over the years. Using base cabinets from a big box store as the base, I purchased pine boards from The Home Depot and created a desktop that was really, one of the most economical DIY I’ve ever done. 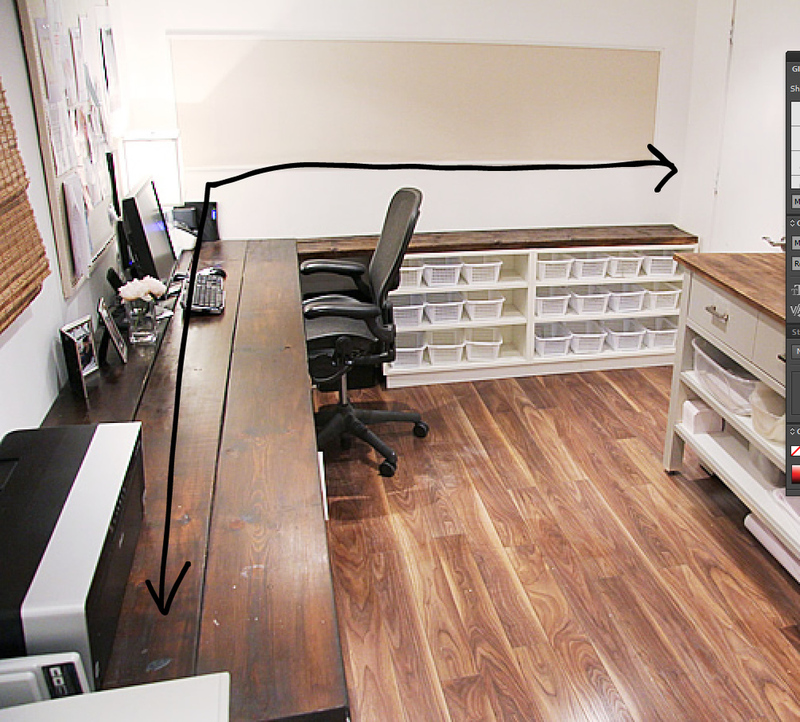 If you’re looking for a really great way to have a custom desk with little investment, or commitment – I still recommend this route and lots of you have followed suit like John & Sherry over at Young House Love. My brother has done it in his apartment, and my best friends husband did something similar although he went the route of a live edge piece of wood. Making your own desk is really an economical way to fit a workspace into your home with little investement. Stage 1 – Basic desk using big box store base and Home Depot wood planks for the top. Over the years my office changed (which I’ll get into another post and reveal.) But some things have stayed the same. My need for an office space, and, a comfortable work area. 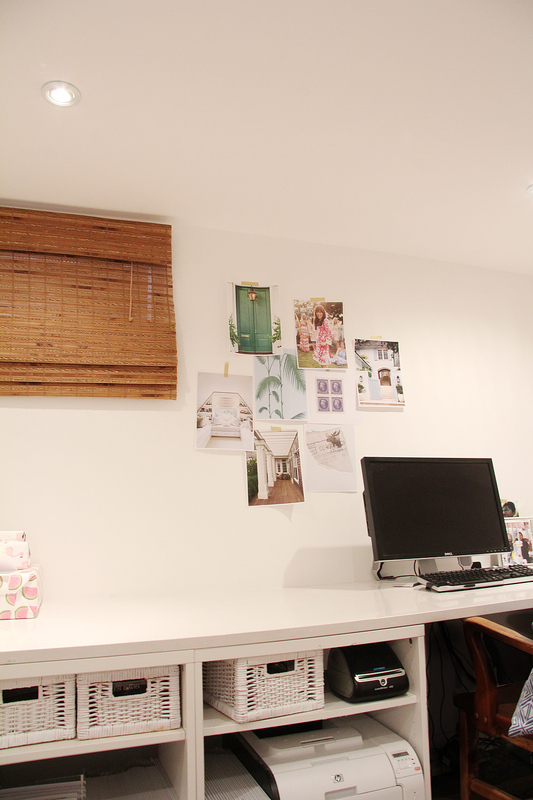 My work area hasn`t changed dramatically since I moved into the home however I was finding it rather DARK in my office. Although my wood desktop was economical, it was sucking light from my small office. I debated painting the top in white, but I use my desk a lot, and I knew that this would have been a temporary fix and it would eventually chip. I could get glass cut to go over the top of it, but the wood is uneven, and the glass (which is completely flat) would have wobbled on an uneven surface. I had been using the office for so many years that I was completely comfortable with the layout and, where I worked, so I started researching investment updates. Like quartz. Having installed quartz in our kitchen, I immediately thought – why not use a kitchen countertop product in an office. Its bright. It’s a hard surface, great for working on. It reflects light, which is perfect in a small space.. It is a perfect update. Stage 2 / Increasing the storage space – adding more wood for the top from home depot. I approached The Home Depot about the project and they shared my enthusiasm for updating this pretty popular DIY project that many of you have pinned, saved, and recreated yourselves. The countertop was provided to me from the team over at the Home Depot because they shared my love of the idea of showing you, how you can use materials, like a kitchen countertop material – quartz – in unique ways. Like your own desk. We knew that we wanted to do the desk + extenstion that I had added on since the original project. We measured, and brought those measurements to Home Depot Kitchen department for them to quote. They will need to know things like if you need a joint (which we did, because a full piece with the L shape wouldn’t fit down into our basement) With the measurements, you can start pricing out different quartz samples. There are different levels of pricing, classified into groups A, B, C, D and things like the edge / profile of your counter all play into the cost. The next step was that someone from a third party installation service, arranged by The Home Depot kitchen department, contacted us to set up a time for someone to do a proper measurement. When the “measure guy“ came, they ask things so be prepared to know what you want. Here are some tips. Know where you need holes drilled. I needed one right behind my monitor for where the cords go. Know where you want the countertop edge to go to. I didn`t want an overhang by my chair. I wanted the edge of the counter to go flush with the cabinets. On the wall to the right of where I sit (the extention that we added) weve added doors to the cabinetry since I last wrote. They recommended I make the counter go right over the doors. Typically people have handles on doors (like, duh) but I knew I wasn`t adding handles ever, so asked that the countertop go just to the cabinet, not over the door, so I could open the door by pulling on the top of the door. This is a scenario where I knew how I worked, and I was really comfortable going against their recommendation. Once you`ve gone through all this they show you a revised quote of the project. It will likely vary ever so slightly from the first quote, as you may add more holes that you hadn`t expected, or, changed something. But the quotes were very close and we signed off on it. This process takes a few tweaks from when we originally created and hacked my desk. We now needed to be able to support the weight of the quatz countertop prior to the installation. (wood is WAY lighter) Aubrey started installing braces along the wall. In a kitchen, your cabinetry would go to wall. But since we’re using big box store bases that aren’t designed for this, we have to “hack” it a little. Here are some things you should know if you’re going to go this route. You need to have the cabinetry attached to the wall so it doesn’t move. The installer said they wouldn’t install unless this was done, and I get it – you don’t want to mess with a big piece of quartz. So for any cabinetry against a wall (like the ones in the background) we actually drilled the cabinets to The wall. For the free floating cabinets where there was space between the back of the cabinet and the wall, we installed a wall brace (which was needed for the weight anyways) but we attached the cabinet to the braces – which meant the cabinets, were attached. Problem solved! The third party installer calls back with an installation day which is a few weeks after you sign off on the measurement and project. You confirm a date, and a window of time and they arrived on the dot. Really, you sit back, and come down for the reveal. It`s delightful. No words the excitement when I came downstairsd and saw this. This is where I`m sitting now as I write this post. And, write other posts you read. I`ve been using my office since February like this, tweaking elements. It`s always a work in progress, but I wanted to finally show you the “AFTER`in all her glory. You can see that the edge goes straight to the edge of the cabinetry. I LOVE THE QUARTZ. It`s amazing. It`s solid, bright, relects light, and my coffee doesn`t leave any stains! WHEEEE!!! Ps., Stay tuned for a full basement reveal. We have done a few changes!